In a world where the real and virtual are one and the same and the dead can come back to life, the damsel in distress may be none other than the infamous Quellcrist Falconer, the vaporized symbol of a freedom now gone from Harlan's World. Kovacs can deal with the madness of AI. He can do his part in a battle against biomachines gone wild, search for a three-centuries-old missing weapons system, and live with a blood feud with the yakuza, and even with the betrayal of people he once trusted. But when his relationship with 'the' Falconer brings him an enemy specially designed to destroy him, he knows it's time to be afraid. 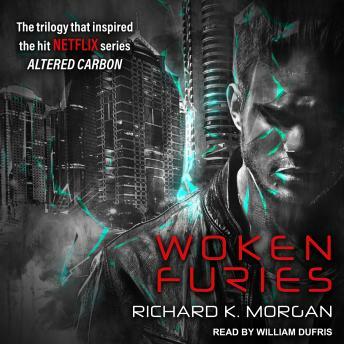 Richard K. Morgan has crafted quite the alternative universe populated with tough cyberpunks and ruling families. Woken Furies is the 3rd installment featuring the anti-hero Takeshi Kovaks. While its an interesting story, I found it a bit too long and filled with many characters that were hard to keep track of. While overall its a good read, I liked the theme of noir detective/investigator in Altered Carbon more than the tough guy, take-no-prisoners flavor of this novel. After growing used to the very good reading quality of the first two books, William Durfis has ruined this final installment faster than any other series I've read or listened to. From the horrible toilet quality prologue to his very arbitrary inflections trying to stimulate reading emotion where it doesn't belong to his simple misspronunciation of the protagonists first name, I am not interested in the slightest to continue listening. I'll simply buy a paperback copy and read it myself. Nothing against William but.. it's just not my cup of tea. I really enjoyed the first two books of the series. The dialogue in all the books is excellent. However, this book tended to be hard to follow and I got bored. It really seemed to have no clear direction and went hopping from point to point. It isn't the best of the series but has a good plot and is consistent with the character. A little slow on action and heavy on back story...but worth the listen.